You may notice some of the notes (like this one) are cropped and pieced together, these were originally on separate pages, however in an effort to keep all emails together we are posting like this. We have only removed personal information such as PHONE NUMBERS that were exchanged between parties. 1. Shirica has NO PROBLEM with helping Mike with the OSBI investigation? Then goes on to say that she isn’t sure… yet up to this point she has shared OSBI information and DA info, as previously stated in emails. 2. Advice for the “possible” murderer? What the heck, in one sentence she says she isn’t sure that he is the murderer, then in the next she is giving advice!! NOT NORMAL. 3. I am wondering which road it was that they have taken the whole time? The MUD road??? 4. Pray that Mike finds peace? How can she in good conscience say that? Does that sound like luring? It sounds like an “old friend”, not like she was talking to the possible (in her words) murderer of her niece!! SICK. 1. This is a fictitious email address set up by MIKE PORTER – emails from this address are HIM. 2. As previously discussed, the amount of evidence had NOTHING to do with bond. 3. Usually the one screaming from the roof top, is the one “who done it”…. 4. Here is where you know that the “sisters” weren’t around Kelsey or Raye Dawn enough to know the things that were previously said…so you know this must be Mike, also if I were writing a letter to someone I would refer to my brother as ‘my brother” not “our” brother…right??? That is a written cue of deception. Plus Shirica admitted in a post she knew it was Mike Porter all along. He was the one on their "bashboard" joking with them. They made statements on that board like "Mike Porter's hot" and that Mike should marry one of Lance's sisters and raise Mike and Raye Dawn's child. Sick!!! "Oh wouldn't this be funn?!?! Mike Porter is found innocent but Raye Dawn is found guilty and goes to prison for a very, very, very long time. She becomes ugly, haggard, and a girlfriend. Mike goes to the Briggs' to express his sympathy and regrets. He gets close to one of the Briggs daughters. They get married and raise Blaine. The rage and bitterness becomes more than Gayla and Mildred can stand. They get arrested for plotting to murder Kathie. They are convicted and sentenced to the same penetentiary as Raye Dawn!!!!" "I guess that's how you get everyone to be quiet, say Porter is hot haha Porter's hot, Porter's hot"
Let's review - Who was up at midnight emailing each other and posting on the "bashboard"? On June 10th 2006, who knew that Mike had gone to the Briggs to express his sympathy and regrets? Who knew Mike Porter was in contact with a Briggs daughter? This was BEFORE anyone but the Briggs and the Porters knew about the meeting and the emails...Think about it! I think this is a VERY interesting point though!! Let's not overlook what TRUTH is trying to point out!! FACT: Michael Porter and Shirica were emailing back and forth. 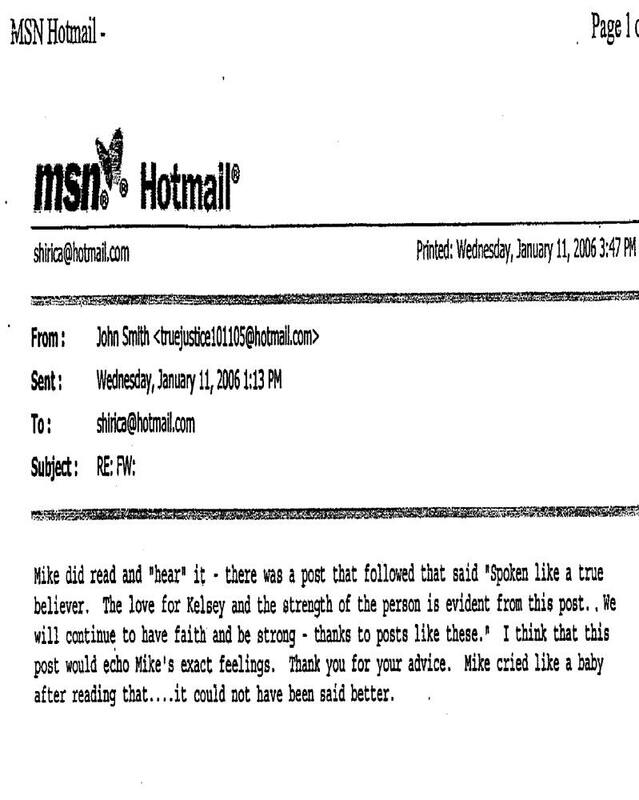 FACT: Michael Porter and Kathie Briggs were emailing back and forth. FACT: Most of the the E-Mails took place late at night. FACT: Michael Porter was charged with MURDER and SEXUAL ASSAULT. FACT: Richard Smothermon stated on camera that there was NEVER ANY EVIDENCE to insinuate that Raye Dawn took part in any of the abuse that killed Kelsey. FACT: The Briggs family agreed to a plea agreement with Michael Porter (the scum accused of MURDER and SEXUAL ASSAULT) but refused to agree to the same for Raye. CONCLUSION: The Briggs were the ones online running their mouths at night, leaving hints and clues to what was really going on with this case!!! They claim that Raye Dawn was after Michael Porter for his money, but really wasn't it the other way around???!!! These are posts from the actual "bashboard" that is being discussed in these emails. The "bashboard" Kathie admits to being addicted to. For those of you who want to know what Kelsey's Purpose members are really like...and they state in these posts that they're KP!!!! Oh, and the Smiths are the ones who paid for Kelsey's funeral. Lance got paid on two life insurance policies for her and there was the victim's protection fund that paid for one funeral, but since the Briggs insisted on their own, the Smith's were left to pay the balance. Who knows where the life insurance money went! 1. If everything that they were doing was on the up and up, what would they care if there were listening devices or recording devices in the room? 2. Also, I feel that she was fishing to see if Mike still had access to this stuff, because they were planning a meeting – and wanted to be aware of all of the possibilities. 1. I want to believe that about supporting Kelsey, however it seems that they all had their own agendas and none of them included getting justice for Kelsey. 2. Note that this is an actual letter from Mike – note the language usage and the … as well as sentence structure. It is EASY to tell that the other emails are from him as well. This is from Jeanna Fowler (Shirica’s sister) guess Shirica isn’t as “trustworthy” as she said she was. 1. This is CLEAR EVIDENCE that the family was “planning and developing the MEANS and actions to EXECUTE a plan to get Raye-Dawn arrested. MOTIVE, MEANS and EXECUTION all of the elements required for a conspiracy. 2. What is the RIGHT crime? In the Briggs’ eyes it was MURDER – however there was NEVER any evidence against Raye-Dawn. 3. God is using Mike to be Kelsey’s voice? Are you kidding me? Does this sound like they are LURING Mike in?? No - that too was a bald faced lie. 4. Yeah, I’m glad I didn’t hold my breath on that one, waiting for Mike to be Kelsey’s voice and bring Justice for Kelsey. That is just SICK – I can’t even stomach reading that. 5. Jeanna was Raye Dawn's good friend in school and afterward. 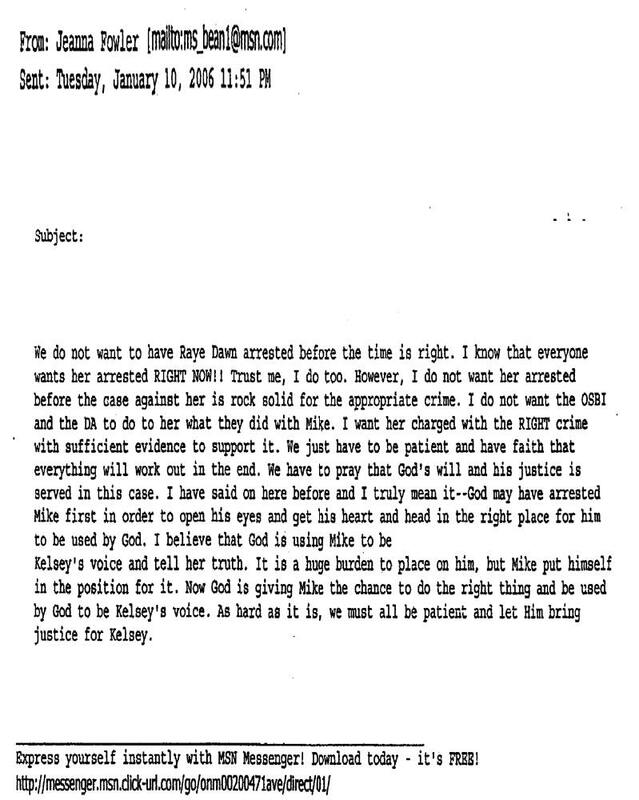 Jeanna is the one Raye Dawn listened to when Jeanna talked Raye Dawn out of going through with the charges against Lance for abuse. Here they are referring to the “bash board’ – there must have been a post that was in Mike’s favor and they wanted to be sure that he saw it, read it and “heard’ it. More luring? Or scratching each other’s backs?? ?